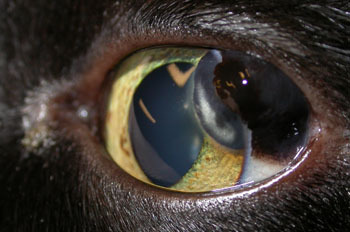 A seemingly easy one here – what is this lesion in this cat eye? This looks like a limbal melanoma doesn’t it – but my concern is that there is infiltration intoi the cornea from deep sclera. In the dog limbal melanomas are pretty benign but my concern is that this is more worrying. It let you know what happens to it after removal! This entry was posted in Cases and tagged cat, Limbal Melanoma. Bookmark the permalink.